Texas Instruments DLP4710EVM-LC DLP Light Control Evaluation Module (EVM) is an easy-to-use evaluation platform for the DLP4710. The EVM offers a broad assortment of industrial applications like 3D printing, 3D scanning, medical imaging and automated optical inspection (AOI). The module supports two configurable input triggers and one configurable output trigger to enable convenient synchronisation with sensors, cameras, or other peripheral devices. The EVM comprises a DLP4710 (0.47 1080p) DMD, 2 DLPC3479 display and light controller and a DLPA3005 PMIC/LED driver. 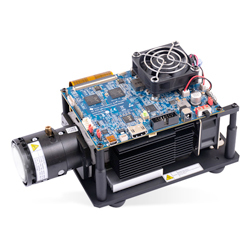 The module comes equipped with a production-ready optical engine and offers a compelling combination of resolution (Full HD), brightness, speed and programmability in a small form factor.